HI Therapies Specialised Face & Body Treatments are bespoke to our Salon. We have created them in line with your every day needs and combined the best of what we offer to target your concerns. We are the only Salon in Bournemouth, Poole & surrounding areas to offer facials combining CACI, Environ & Oxygen. 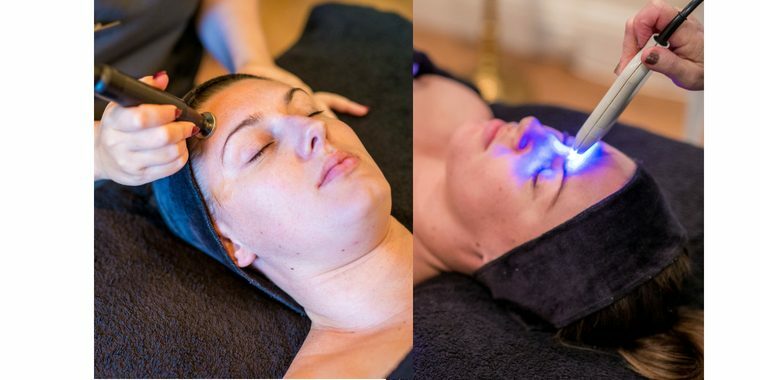 Includes an in-depth consultation (15mins) and a bespoke and unique facial designed to meet your need, which can include benefits from all 3 of our facial machines. Includes a bespoke HI Therapies Full Facial designed to your needs and a JemmaCo tailored 30 minute massage of your choice. This facial is one of a kind in Bournemouth. We are the only salon to hold both the Environ machine and CACI Synergy machine, simply because we want results. The Environ machine helps penetrate products 4000 times deeper than a normal hands on facial, whilst the galvanic current from the CACI machine and high brilliance LED light therapy will help to lift, tighten and help the appearance of sagging muscles. A combination of these two powerful and results driven machines will certainly not leave you disappointed! CACI jowl lift has been developed to specifically target muscle laxity around the jawline which can cause drooping jowls and loose skin. Using the powerful CACI Synergy & Environ DF machine to lift and firm the muscles around the jawline and help contour, firm and reduce fine lines and wrinkles. This treatment is specially designed to refine facial contours to give a firmer, more toned appearance. Using the powerful CACI Synergy & Environ DF machine to lift the eye area, this express treatment will help improve fine lines, wrinkles, dark circles and puffiness that occurs in the eye area. CACI Synergy wrinkle comb helps promote and stimulate elastin and collagen, whilst the Environ DF machine will help to plump lips and infuse the lip area with essential collagen, vitamins and anti-ageing peptides to help smooth out fine lines around the mouth. Using the famous CACI Electro-Cellulite massager, this treatment is designed to improve circulation and help breakdown fatty deposits on the upper leg and buttocks area. It helps to improve circulation leaving you with a smoother and firmer appearance. Are you ready to book? We would highly recommend booking a FREE consultation with our highly experienced therapists if you are a new customer. Receive 15% off your first online booking by clicking HERE. Don’t forget we offer course options too – ask your Therapist about our great savings!